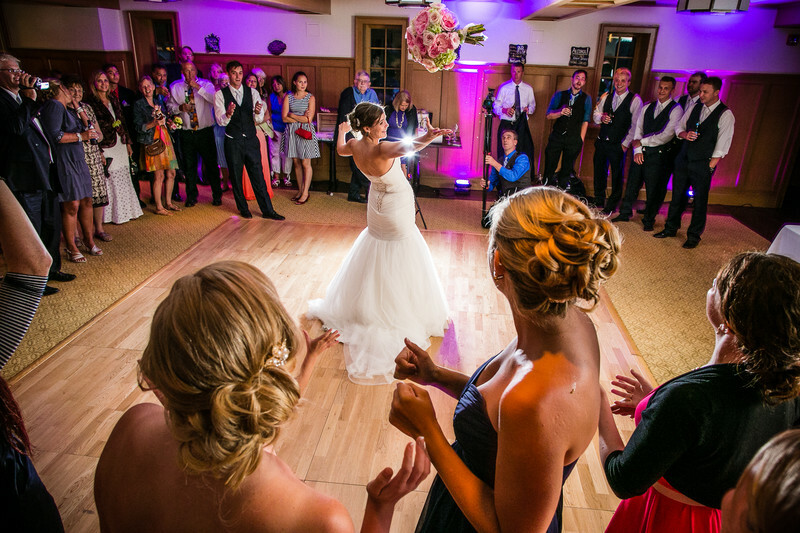 The bouquet toss at a wedding. So much action in a really short period of time. I am seeing less of this event which is unfortunate. For this particular picture at a wedding at the Paine Art Center and Gardens in Oshkosh, Wisconsin I positioned myself right in the middle of the action. The bride could not find the throwing bouquet so she ended up throwing her full sized flower arrangement. It was quite the experience having a head-sized mass of flower hurling towards my face! This photograph was taken with a Canon 5D Mark III and EF 24mm f/1.4L II lens. The bride is being backlit by an Alien Bees 800 and the side light is a Canon 580EX bounced onto the wall. 1/20; f/9.0; ISO 3200; 24.0 mm.